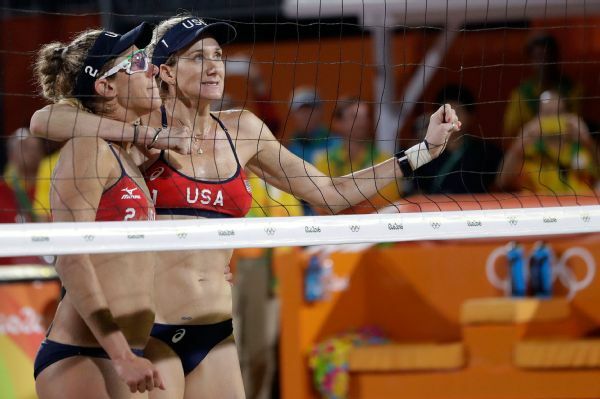 RIO DE JANEIRO -- If Kerri Walsh Jennings winds up with a fourth medal in Olympic beach volleyball, it will be bronze -- not gold, like the other three she earned in what had been an unblemished record at the Summer Games. Walsh Jennings and her partner, April Ross, were relegated to the third-place game by Brazil's reigning world champions, who beat the Americans in straight sets on Tuesday night to advance to a gold-medal matchup with Germany. "We could squash that team, and I say that with all the respect in the world," Walsh Jennings said. "But they outplayed us in every way." Agatha and Barbara rode a boisterous crowd at the Copacabana venue to a 22-20, 21-18 victory, keeping alive the host nation's chances for a gold medal after its top-seeded team lost to Germany earlier in the day. The best Kerri Walsh Jennings and April Ross can do now is a bronze medal when they play Brazil's other women's team on Wednesday. 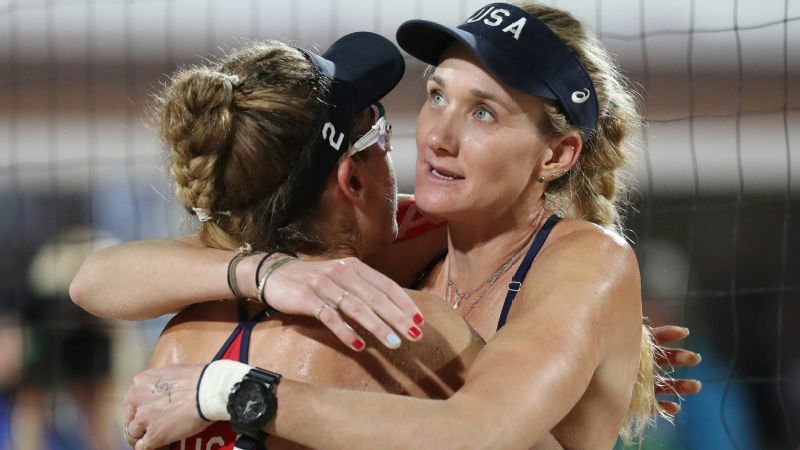 It was the first match loss in Walsh Jennings' Olympic beach volleyball career, in which she had claimed gold medals in Athens, Beijing and London with partner Misty May-Treanor. Before Tuesday night, she had lost only two sets in her Olympic beach volleyball career. She now has a 26-1 record and is 52-4 in sets. She also lost with the indoor volleyball team in 2000 in Sydney. "It's a terrible feeling," Walsh Jennings said, taking the blame for the loss by saying her failure to pass effectively put her partner in a bind. "I don't agree with that," Ross said. "The roles have been reversed before; I could have done a lot more. We're a team," Ross said, starting a thought but never finishing it before repeating, "We're a team." Asked whether she can come back for another try at a gold medal, Walsh Jennings said, "I know I can. I just don't know if I want to." Walsh Jennings said they would be proud to stand on the podium, and their focus now is to recover from the emotional loss in the less than 21 hours they have before the third-place match against Brazil's Larissa and Talita, a pair of three-time Olympians. "It's a huge deal," said Ross, who won the silver medal in London. Brazilian men's team Alison and Bruno also advanced to the gold-medal game by beating the Netherlands earlier Tuesday. Italy defeated Russia in the other men's semifinal to clinch its first Olympic beach volleyball medal. The men's final is Thursday. With a 21-18, 21-12 victory, Laura Ludwig and Kira Walkenhorst clinched Germany's first Olympic medal in women's beach volleyball. "I think it will take some time to realize what we did here," Ludwig said. "We had some tough times, and now we're in the final." The German men won the gold medal in London. But to match that feat in Rio, the women will have to beat the defending world champions. Brazil still has a chance to match its 2004 Olympic haul of three medals. Despite failing to make the final, Talita said she would never forget playing in front of the hometown crowd on the iconic beach. "I am so proud of my people, the Brazilian people," Talita said.